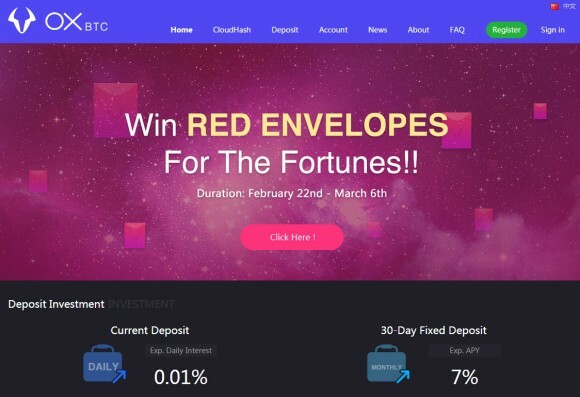 The crypto mining and deposits with interest platform OXBTC has announced a Red Envelopes promotion in celebration to the Chinese New Year. This promotion allows newly registered users to get some free Bitcoin cloud mining hashrate at the platform absolutely free for 1 month. Depending on your luck you, when you open your Red Envolope, you might win between 1 GHS and 1000 GHS and the hashrate you get will be available in your account for 1 month and you get to keep all of the profits it generates without having to invest or buy anything. The duration of the promotion is between February 22nd and March 6th, so don’t miss your chance to get some free hashrate for a month and earn some extra BTC. This promotion is probably in order to stimulate more people to buy cloud mining hashrate at the platform as apparently there is not much interest from users as expected with the high prices for hashrate. 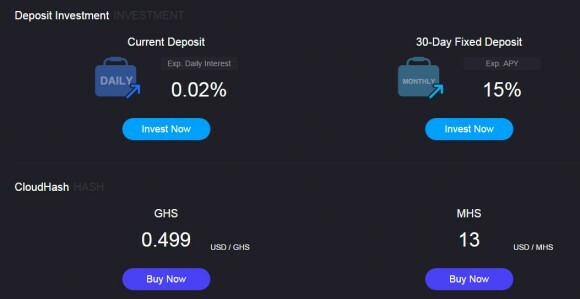 The initial price of $0.499 USD per GHS with $0.0009 USD per GHS per day maintenance fee was not very attractive and while there is now a new price at $0.399 USD per GHS with $0.0007 USD per GHS per day maintenance fee it is still not too attractive with the recent jumps in Bitcoin’s network hashrate and difficulty. The $13 USD per MHS for Litecoin cloud mining hashrate is also pretty high (Maintenance Fee: $0.02 / MHS / Day), even though LTC has shown pretty stable difficulty level and price for quite a while making it more predictable for profit calculation on the long term. With the not so great track record that the company previously had with the ZeusHash it is no wonder that they are not doing great with hashrate sales in this new platform as well, but when they give you free hashrate why not take it anyway. Unfortunately their deposits with interest service is getting less attractive than it was before with Current Deposits down from 0.02% daily to 0.01% (cut in half) and the 30-Day Fixed Deposits are down from 15% APY to just 7%. Interestingly enough the HalleyBTC Bitcoin savings investment platform operated by the same people still has the same 0.02% daily interest rate and 15% APY for 3-day fixed deposits. A new cryptocurrency investment platform has been launched called OXBTC that combines Bitcoin and Litecoin cloud mining with Bitcoin and Litecoin deposits with interest. What the service essentially combines is the ZeusHash cloud mining platform with the HalleyBTC Bitcoin savings investment platform and is apparently operated by the same people behind these two other services. OXBTC extends a bit the basic functionality offered by the other two platforms and combines them into a single one to make it easy for users, or this should be the idea, but it could as easy be considered as a rebranding just to attract new customers. The claims that they are making about the “World’s Highest ROI” on their homepage are probably a bit far fetched, especially with the cloud mining with the not so low prices and the recent serious jump in the difficulty of the Bitcoin network especially, so the part with the deposits with interest might be more attractive option. The extra advantage available here is that you can have both deposits in BTC and in LTC and you have two options – 0.02% daily interest rate on deposits or 30-day fixed deposit with 15% Expected APY, available for both Bitcoin and Litecoin. The difference from HalleyBTC is the availability of Litecoin deposits here, however the 90-day Fixed deposit with 17% Expected APY is not available at OXBTC. The other option you have is to invest in cloud mining hashrate and you again have the option to purchase both SHA256 hashrate for mining Bitcoin as well as Scrypt hashrate for mining Litecoin, just like on ZeusHash, however here you should also have the ability to trade the hashrate you have purchased. The market for trading BTC and LTC cloud mining hashrate however is still not operational apparently as the service has just launched, so it will most likely become active shortly. The regular price for cloud mining hashrate is 0.499 USD per GHS for Bitcoin hashrate (Maintenance Fee: $0.0009 / GHS / Day) and 13 USD per MHS for Litecoin hashrate (Maintenance Fee: $0.02 / MHS / Day). The prices here are a bit higher than they were at ZeusMiner, but the maintenance fee is a bit lower and OXBTC also offers Scrypt hashrate that is no longer available for quite some time at ZeusMiner. The new platform might seem quite interesting to check out, however we would advice caution with it, because it is apparently being operated by the same people behind ZeusMiner and ZeusHash and we have seen some negative things from them. For example there were numerous issues with their cloud mining platform and even at the moment ZeusMiner is not fully functional, wallets are not working and you cannot withdraw any balances and mining does not seem to be working. Their other platform HalleyBTC does seem to be working fine for the moment, but we would still advice caution – better be safe than sorry. Still, more out of curiosity, we are going to be checking out the new service to see what they have made this time.